How to prepare a seafood mix? Seafood cocktail is becoming more popular among Russian hostesses. Cooked seafood dish can be a daily, and holidays. Ready-mix for seafood cocktails frozen sold in almost any grocery store. The dish turned out tasty and useful, It should take a responsible approach to the choice of a blank for a cocktail. It is important to make sure, the mixture was frozen only once and never melted. Otherwise, there is a product to be dangerous to life. Typically cocktail mixture are octopus, mussels, squid, shrimp. Sometimes, the composition may be changed, this should be read in the product description. Cooking seafood mix based on the workpiece easy and simple. the main thing, not digest and keep longer half an hour at room temperature. All components of the mixture are cooked simultaneously in the same container. Water for cooking is poured into the pan, put on the fire and brought to a boil. Cocktail mixture was defrosted either in a microwave oven, or at room temperature can not: directly in a frozen form, it is placed in boiling water for about 8 minutes. However, the time, indicated on the packaging, may differ, so you should follow the manufacturer's recommendations, especially during the first cocktails from a particular firm. Cheese (100g) rubs on the grater, cocktail seafood is cooked for a required time. tomatoes (200g) cut into wedges, onions Shinko, olives, cucumber and bell peppers also cut. Five large shrimp need to pour boiling water on 3 minutes. Then remove them from the shell. 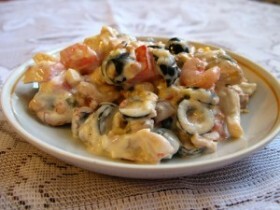 In a separate bowl squeezed juice of one lemon, put cooked seafood mix, sliced ​​vegetables, olives and shrimp. All thoroughly mixed, added salt and seasoning to taste – the salad is ready. To receive every time new flavors, you need to cook seafood mix with various additives: vegetables, spices, cheese, cream, various sauces and seasonings. The selected type of pasta, such as spaghetti, cooked according to instructions, frozen cocktail mixture for marine is placed on a heated pan. Fry in olive oil is better. The mass can be further pour cream, to get a special refined taste. The mixture was continued to stir for three minutes pan, further shifted in a separate container, which cut pepper, greenery, garlic, olives. Fill all can be mixed with 50g of olive oil the juice of half a lemon. Then in general a mixture of cooked pasta are added. 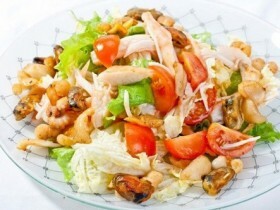 Cooking seafood mix in this manner is not only very tasty, but also economically, it turns not just a salad or a dessert, and now a full-fledged meal. Besides, of Sea cocktail can prepare delicious pizzas and excellent soup, as well as many other dishes, which are easily absorbed by the body and are rich in vitamins. How to correctly check out of the apartment?